1. If using frozen corn, drain between layers of paper towels until thawed, about 30 minutes. 2. In a wide skillet, melt half the butter over high heat. 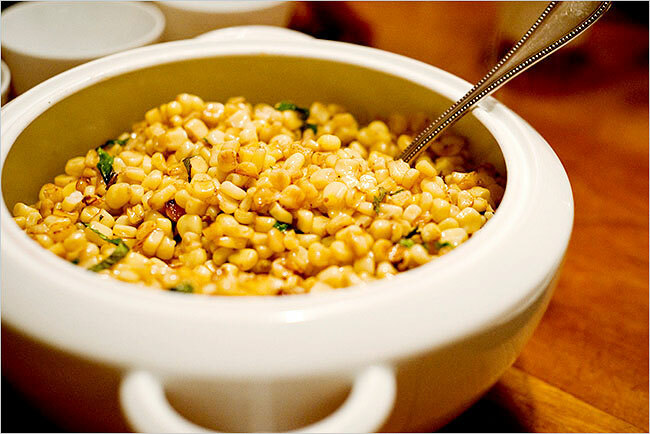 Add half the corn and cook, stirring often, until golden and browned (kernels may begin to pop), about 10 minutes. Stir in half the mint and sprinkle with salt. Transfer to a serving bowl. Repeat with remaining corn, butter, mint and salt. I know it seems simply and easy enough but when I think of how many times we just boil ears of corn or (dirty little secret exposed here) heat threw some frozen corn....it's nice to remember that in only a few minutes we can still add a little flavor and flare to vegetables.